As I've noted before, the Mount's architect was Mark Daniels, a century ago one of the most prominent in California. Trained as a landscape engineer and something of a naturalist (he was superintendent of Yosemite National Park) he is credited with the 17-Mile Drive at Pebble Beach, Thousand Oaks area in Berkeley, and other ritzy Bay Area neighborhoods. Daniels designed the model home for the subdivision. It was heavily publicized as the "Los Angeles Times Demonstration Home," meant to embody the classic Southern California lifestyle but featuring state of the art techniques -- "the last word in construction" -- and even ultramodern amenities like a dishwasher. Times readers were given weekly updates in breathless language as construction progressed. What's interesting is that this happened to be the same time Daniels was enlisted to design a master plan for Mount St. Mary's College. 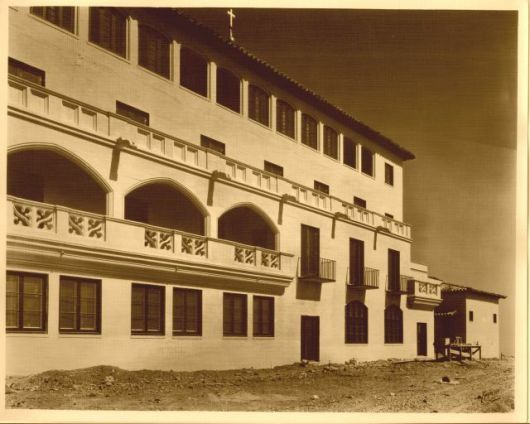 There was a built-in connection: the Sisters of St. Joseph purchased the College property from the same oilmen who had sold the land for Miramar Estates and a big parcel down the hill from the Mount in a neighborhood called "Riviera." From rooflines and archways to chimney tops, vents and wrought iron, the Demonstration Home and Brady Hall reveal a detailed and exquisite architectural vision. In fact, Daniels had traveled to Madrid in 1928 to design a palace for a Spanish nobleman, the Marquis de Portago, a tribute to an architect who could out-Spanish the Spaniards on their own turf. Looking at the Miramar Estates area now, with its expensive homes and expansive views, it's almost impossible to believe that the development went bust. But it did, the victim of stock markets, gasoline prices and real estate bubbles. (Some things never change.) Daniels' vast plans for the Mount were only realized on a much smaller scale in the 1940s after a hiatus in building of nearly 10 years. 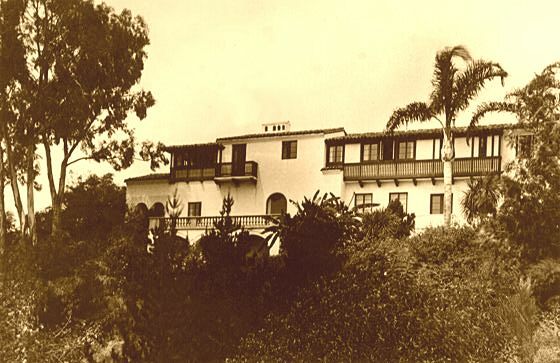 Plans by some of the oilmen to build a cement plant between Miramar and the Mount were defeated by neighbors like Mary Pickford. 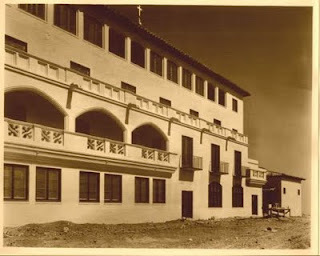 Though few people know it, the Chalon Campus has an architectural pedigree that is rooted deeply in Los Angeles history. The Doheny Docents are in for a nice surprise -- another beautiful campus to introduce to history buffs.